Sure, you can buy brownie mixes and pre-made brownies at your local grocery store—but why would you, when there are so many exotic and delicious gourmet brownies just a click away online? Here are a few of our editor’s favorite reasons to purchase brownies online. There is no need to even leave your home! Thanks to online shopping we now have access to the highest-quality gourmet goods from top bakeshops throughout the country and world. When shopping for brownies online shoppers can shop directly from award-winning bakeries, like South Hampton’s famous Tate’s Bakeshop and much-buzzed-about shops like the Vermont Brownie Company—seen on the Food Network. If you want to find brownies from top bakeries all in one place, gourmet vendors like iGourmet.com, Chocolate.org and 1-800-Bakery.com curate a selection from bakeshops around the world for purchase on their websites. 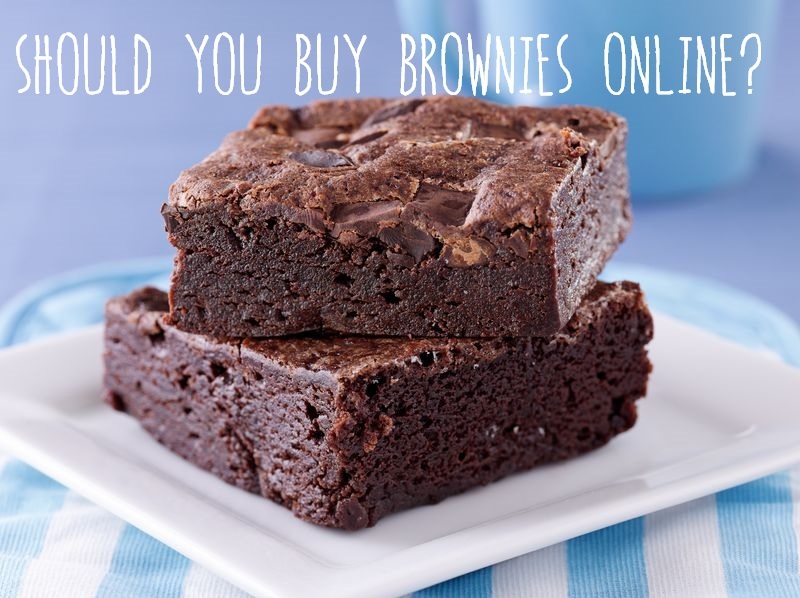 One of our top reasons to buy our gourmet brownies online is convenience. We are all busy, and sometimes just don’t have time to get to the store. When you shop for gourmet brownies online, you can indulge in your favorite treat or find the perfect gift without a stressful trip to the store. Find delicious baked goods that fit into your diet! Tired of eating gluten-free cookies from your grocery store that taste like cardboard? It is time to check out some online bakeries to find yummy gluten-free and sugar-free treats that fit into your diet with out compromising taste. Bakeshops like Ruth’s Brownie Kitchen don’t think you should have to sacrifice flavor just because you have Celiac disease. This bakery uses a buckwheat flour substitute to create five delightful flavors that taste just as good as brownies baked with traditional flour. Many bakeries, like Cheryl’s, also have a wide selection of sugar-free cookies and brownies—letting you indulge without harming your health! Worried about cross-contamination? Many bakeries like Dancing Deer Baking Co. take your food allergies seriously and create their moist and fudgy gluten-free brownies in a completely separate, gluten-free facility. Gifting gourmet brownies from online bakeshops is an easy, hassle-free way to show those long-distanced loved ones that you care! All of these bakeshops have perfected the art of shipping delicate baked goods and most ship throughout the entire country. Send the perfect gift with one click—no need to stress over a trip to your local post office. Did someone say free gift wrap? If you are like us, you often end up scrambling to wrap your gifts at the last minute. Most of the gourmet bakeries provide beautiful gift wrapping in their signature packaging. Many of these bakeshops also have customizable packaging options for a variety of holidays and life events. For instance, Bake Me A Wish can adapt their gift packaging for 12 different events including Happy Anniversary, Get Well and Happy Birthday. Sometimes indulging in the same classic flavors is great—but now and then we want to try something new and exciting. Shopping at online bakeries is a great way to try original, one-of-a-kind flavors that you won’t find at your grocery store! Many of these bakeries like Sugardaddy’s Sumptuous Sweeties pride themselves on their unique flavor options—some include their Campfire Blond, a s’more-inspired brownie and their Rich Mint Brunette, which incorporates a mint icing into the classic treat. These are just a few of the great reasons to ditch the local grocery store and get shopping for gourmet brownies online. So power up your computer and get shopping. Ready, set, GO!